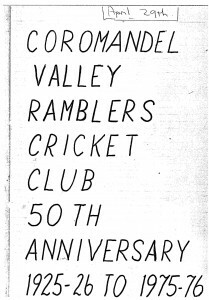 The 1975-76 season was the 50th birthday of the Coromandel Valley Ramblers Cricket Club. It was decided to hold a past versus present players cricket match as part of these celebrations, with the match being the easy part of the season. It was also decided to produce a publication relating to the statistics of the club to celebrate its 50 years of existence, which was far more difficult than originally expected. The only records the club had were score books dating back to 1946-47 and a few minutes from Annual General Meetings. Fortunately, the Adelaide and Suburban Cricket Association had kept statistical records of each club through score sheets that were completed by clubs at the end of each season. These score sheets were kept under ‘lock and key’ by the then association secretary, Ron Halliday. Our club was able to borrow them for a couple of weeks throughout the season and Peter Hough, Ron Schmidt and myself carefully combed through these score sheets to compile statistics for every player from 1946-47 until 1975-76. 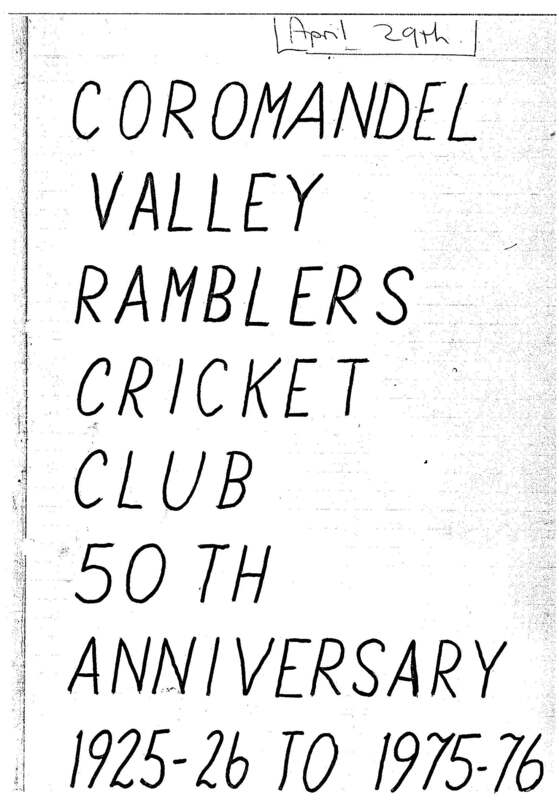 As a point of note, 1946-47 was the first season that the Coromandel Valley Ramblers Cricket Club joined the Adelaide and Suburban Cricket Association and due to this, the records were kept accurately as a matter of need. Prior to the 1946-47 season, records of past players and their achievements were sketchy or just not available, as the club played in another association from its formation year of 1925-26 until World War II. Due to the lack of records from these years, Peter, Ron and myself decided to focus on what was available and leaving aside any incomplete statistics out of the initial magazine. ‘The Declaration’ officially became the name of the end-of-season magazine in its 5th edition in 1979-80. Prior to this, the magazine contained a couple of articles and mostly statistics throughout this period. Due to this, the end-of-season magazine simply went without a name. The name ‘The Declaration’ actually came about in the newsletter item to club members in November, 1979 and it has been with the club ever since. Whilst my recollection of why this newsletter was called ‘The Declaration’ is vague, but it only seemed natural to continue on with the naming when it came to the end-of-season magazine. While newsletters have come, gone, come and gone, the end of season magazine has remained the one constant for all club members to enjoy. From 1979-80, ‘The Declaration’ has remained the name of the end-of-season magazine and is still readily mentioned by everyone within the club towards the end of each season and where they may sit on the various tables of statistics. It is still a major reason as to why many past and present players attend the presentation dinner, as it provides them with the only means to collect one of these cherished magazines. After many hours of work (many more than was expected), the inaugural was produced. This magazine consisted of A and B Grade batting and bowling trophy winners. As there were only two teams at this stage (with a B Grade only being in existence for 6 seasons), the statistics were quite short and sharp. In addition, individual batting and bowling Statistics as well as those who made a century and/or took five wickets in an innings. The end result was very basic compared with what is on offer in the current editions of the magazine. To view the 1975-76 edition of ‘The Declaration’ (Vol 1), please click here. Team, captain and club reports were also made features of each edition. In addition to reports and statistics, the club endeavoured to break each edition up with other features articles, such as cartoons, humorous articles, poems, player profiles and selected highlights from previous seasons. During this period, it must be acknowledged that the help and written material provided by Len Kenyon, Peter Hough, Steve Williams, Peter Phoenix, Andy Dewar, Geoff Jenner and Pat Gillett enabled me to compile the magazine into what is was then and now. To view the 1970’s editions (Vols 1-5) of ‘The Declaration’, please click here. To view the 1980’s editions (Vols 6-14) of ‘The Declaration’, please click here. To view the 1990’s editions (Vols 15-24) of ‘The Declaration’, please click here. From the mid 1990’s, Jarrad Benson and Matthew Smith, as younger members of the club, took on the role of organising a monthly declaration (newsletter) during the season. Instead of being handwritten, computers and word processors began to take over in the production of these magazines. This was helped when Peter Hough placed all of the club’s statistics on his computer and with a touch of a button, he could pull up a player’s record in a matter of seconds. The advent of Meredith Jenner as the magazine editor introduced a set format for the magazine. For the first time, it also included photographs of players, premiership teams and events. Due to this and the move to colour printing, the magazine began to come to life. This was then extended by Matthew Smith in the 2008-09 season. In the 2009-10 season, editor Ashley Bryant produced the largest magazine to date (62 pages compared to 8 in the 1st edition). This edition of the magazine included all of the familiar features, but Ashley has also added features for the juniors, events and sponsors of the club. This process has since continued in the 2010-11 season, whereby a magazine was produced for all programs at the club. Furthermore, the magazine is now also published online through the club’s website, which gives all past and present players access to editions that they may not have, as they missed the presentation dinner. I also know that one or two past Ramblers residing overseas often check to see when/if the magazine is available on the website. To view the 2000’s editions (Vols 25-34) of ‘The Declaration’, please click here. To view the 2010’s editions (Vols 35 so far) of ‘The Declaration’, please click here. With the advent of a junior program, each junior player also has the opportunity to collect a copy of their own magazine, ‘The Declaration: Junior Edition’ at their presentation dinner. This magazine was tailored specifically for the junior audience and included many of the features present in the senior magazine. The only difference between the two (except for the number of pages in recent years), was that every individual within each team is asked to contribute to their magazine and hence, they always have some form of input into how they saw their own and the teams season. To view the 2000’s editions (Vol 1) of ‘The Declaration: Junior Edition’, please click here. 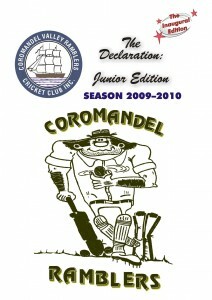 To view the 2010’s editions (Vol 2 so far) of ‘The Declaration: Junior Edition’, please click here. What does ‘The Declaration’ mean to the club? Most players on presentation night rush to grab a copy at the presentation dinner, with the main proviso to check their own statistics. It is certainly a document of great significance, as it is a record of every player’s personal achievements and I know that many past players are keen to see the most current copy. Russell Wight, who wrote the book highlighting the achievements of the first century of the Adelaide and Suburban Cricket Association, has always requested a copy of checking his statistics against the club’s. 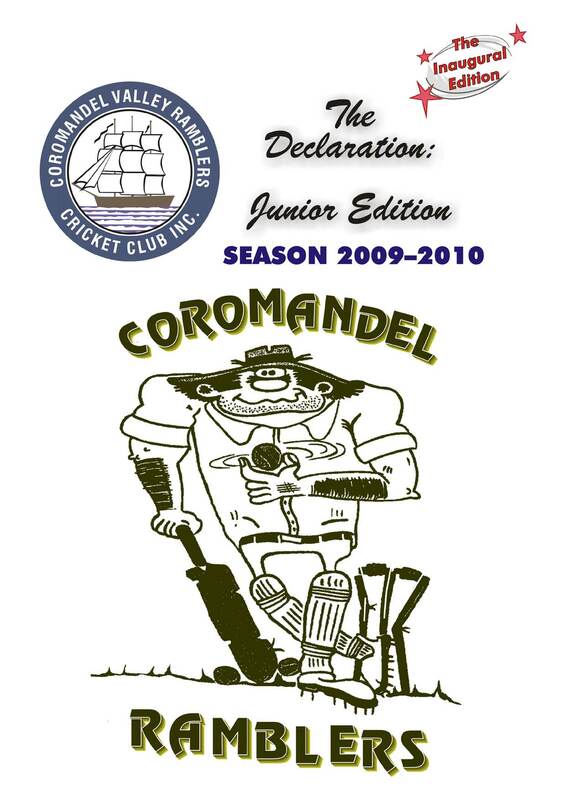 I hope that in the future that the Coromandel Valley Ramblers Cricket Club and its history will be preserved and enhanced by those who submit reports, publish statistics, collate the articles and edit the final product to produce the magazine we affectionately know as ‘The Declaration’.